In a city where there are seemingly as many high-energy children’s zones as there are adult gyms, it’s understandable that you’d want to leave the organizing to the experts. With an eye toward activity variety (ice-skating and swimming in the same complex), plus offbeat experiences like the circus and parkour, here are the best party places to knock out hyperactive tykes. 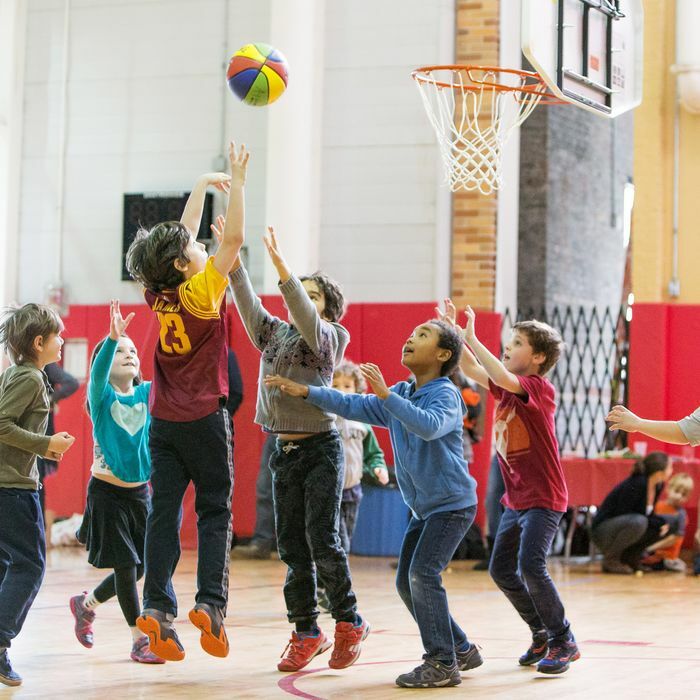 Many multi-sport complexes cater to NYC kids: Chelsea Piers, the 92nd Street Y, two Asphalt Greens, and countless YMCAs all offer quality parties. But in terms of price, diversity of options, and enticing add-ons, Brooklyn’s 175,000-square-foot sports mecca is the birthday spot to beat. Starting as low as $450 for ten kids with the birthday child free, packages include all of the must-haves that often cost extra elsewhere (food, drinks, cake, decorations), plus activities ranging from the usual organized sports to indoor ice-skating and outdoor seasonal swimming to rock climbing and knockerball, where kids suit up like John Travolta in plastic bubbles and crash into each other while kicking around a soccer ball. Bounce houses and other inflatables, an arcade, and various bars — candy, ice cream, or cocktails for adults — are all available for additional fees. The only limit to customizing is your credit card’s: Hours can be added, and activities can be combined. One family splurged on a six-hour carnival. Of course, there’s a caveat: Aviator is located at Floyd Bennett Field in Marine Park and isn’t accessible via subway. But the Q35 bus stops right out front, and the 2,000-spot parking lot is free. With its eye-popping graffiti’d walls (courtesy of neighborhood artists), nonstop hip-hop soundtrack, and multicultural community, this two-level parkour gym invites kids to jump, bounce, and scream until they’re hoarse. Tots too young for the gross-motor challenges of the spot’s signature sport can try tumbling or the (possibly quieter) ninja warrior parties (shhh, stealth is key). Waivers must be signed, and, yes, adults can join in. Yes, it’s a madhouse, with manic kids darting around shooting each other on various themed laser-tag courses (arena, archery, or heavy-duty black ops with much more chilling-looking weaponry). But remember: Your idea of hell is a tween’s idea of hell-yes. No-mess paintball and zombies are also available. Just bring earplugs to try to block out the pounding music and hyped-up squeals. Unlike 7-Eleven or Walmart, this suburban chain is an import city families can appreciate. At locations in far-flung Brooklyn and Queens, kids can bounce in or slide down an impressive array of indoor inflatables. It’s a bit like a factory line, with hosts moving you briskly from room to room, but the fun is infectious and ageless: Lots of moms and dads get in on the action here. Whether you opt for the sleek, new Queens outpost or the original, converted Brooklyn warehouse location, these dedicated rock-climbing gyms offer kids a much tougher workout than your typical scaling wall. For an additional fee, interested parents can do a drop-in fitness class (or relax in the saunas in LIC) while the children make like Spider-Man. Join the fabulous freaks at this 6,000-square-foot circus warehouse, which just celebrated its first anniversary in its current location. From the outside, it looks like industrial NYC circa the ’70s (bonus: lots of free parking). But inside you’ll find state-of-the-art aerial equipment (silks, hammocks, hoops), plus earthbound activities like acrobatics and an obstacle course. Add-ons include a performance, so you can get an up-close look at how the pros work. No, this isn’t the singer’s new foundation. Ask any kid who’s gone to camp and they’ll tell you, it’s a no-holds-barred, Battle of the Network Stars–style elimination game akin to dodgeball played in an octagonal pit. At the only Gaga-exclusive facility in NYC (talk about niche! ), foam balls are used so kids get out, not hurt, and a sound system blares contemporary pop. Games usually last less than five minutes, so downtime is minimal. If you’re looking for a simple bowling party, hit one of the cheaper alleys in the outer boroughs. But this Bowlmor is tailor-made for high-energy kids, with a game room stocked with foosball, Ping-Pong, and more tabletop games; an intimate, NYC-themed laser-tag arena; and an aerial ropes course. Downsides: Those last two have height minimums (44 and 48 inches, respectively), and it’s only one activity per party. This multilevel, 28-acre West Harlem park may not be as spacious or celebrated as Central or Prospect, and that’s a good thing. Its incredible facilities fly relatively under the radar and include a covered rink (ice-skating in winter, roller-skating in summer); a seasonal outdoor pool, and a year-round indoor one; a kid-designed carousel; reservable picnic tables; and a pair of modest playgrounds and stunning Hudson River views. No party packages here; this is strictly do-it-yourself. But if you’ve got the energy to plan it, there’s enough here to tire your hyperactive kids out before the sun sets.